I am a proud eggetarian. I can eat eggs for breakfast ,lunch ,dinner and snacks. So naturally I try to find new ways of having them. 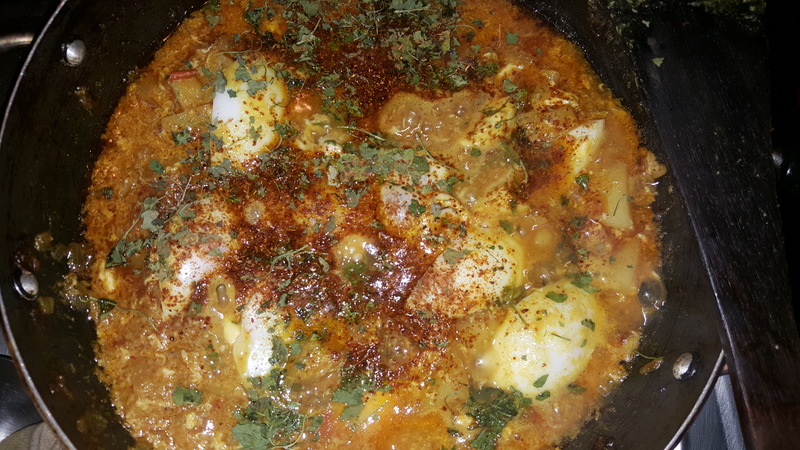 Without letting my love for eggs take me away from the recipe, here it is. Heat oil in a pan add onions and saute. Add the ginger garlic paste and continue to fry this. Once the raw smell of the mix goes add the tomatoes. Saute this to soften tomatoes. Keep the flame on medium. Add the potatoes and mix well. Add the powder ingrediants and keep cooking this. Once the potatoes are slightly browned,season with salt, it will soften the potoates. Add 2 cups of water. Cover with lid and cook for 5-8 mins. Check if potatoes have softened. Break one egg into the mix and scramble it. This will slightly thicken the gravy. Let this cook for 2 mins and then break in the 2 eggs as a poach. Be careful not break the yolk while handling. You can cover the pan for 1 min to let poached egg set. Sprinkle salt on the yolks. Check for seasoning. By this time the curry should be thick and no excess water should be there. Now slice the boiled eggs and add them. Try to coat these with gravy. 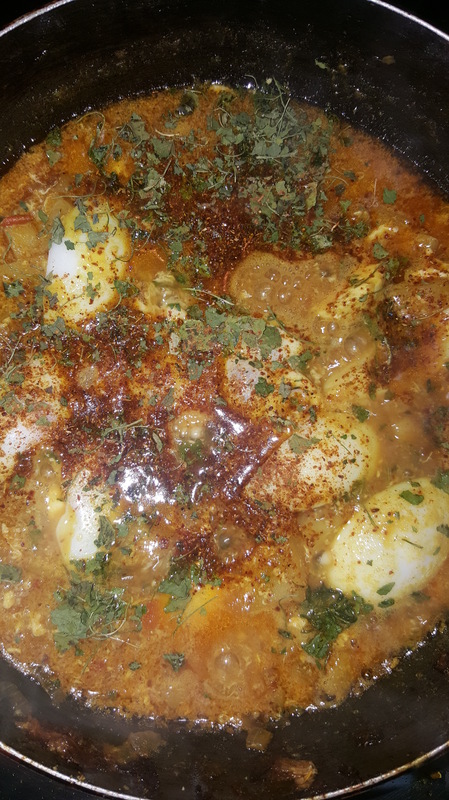 Sprinkle Kasuri methi and some garam masala. Take off heat and serve with roti.